Who is the ominous kid riding on Entei? I'm Hakudoshi. 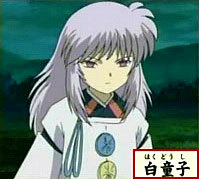 You're right, I'm part of Naraku. The reason you were killing monks and priests was to find the boundary between this world and the next. What could possibly be there? Next on Inuyasha, "Rampaging Entei and the Terrifying Hakudoshi". Why did you tell them such an important secret? Innocent Malice: Fanlisting for Hakudoshi. KAG: Naraku’s baby that has been split into two is still alive. The legendary demon horse, Entei, has allowed a new owner to ride on its back!